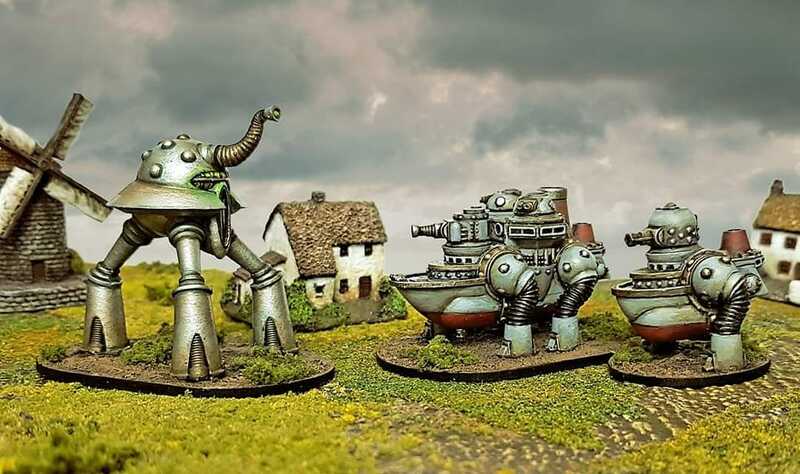 Thunderchild Miniatures is going to release a game called Atomclad….Welcome to the age of the atom…. I have never dropped acid, but I think that that picture has given me a glimpse into the experience. That is way cool…and odd too! I agree with Oberlindes on this one. Wayyyyy trippy! Very nice models & terrain ! Well, I've got ships that float, ships that fly (Aeronef/Imperial Skies) and ships that crawl on land (AQotMF) – but no bipedal ships as of yet. Consider my interest perked. Glad you like them too my good friend!. Checking out the comments on Facebook, they have landships, martian tripods, German saucers, and giant robots planned. Oooh. According to a friend who frequents Facebook, the first wave of Atomclad is due to hit Kickstarter sometime in Feb/March. Mind you, I suspect this timeline might fluctuate depending on how Thunderchild makes out with their new casting endeavour (in the wake of Hysterical Games closure). Yes the picture looks like it should be accompanied by Pink Floyd music.